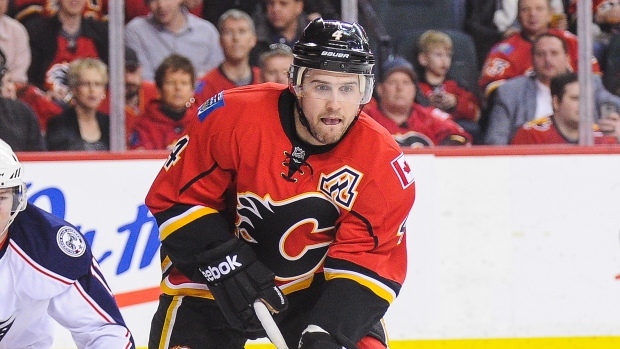 DALLAS - Defenceman Kris Russell is joining Dallas in a costly trade-deadline deal with Calgary that will get more expensive if the Stars make the long playoff run they covet. And general manager Jim Nill feels it's a price his franchise can afford. "We have very good depth within the organization," Nill said Monday after trading young defenceman Jyrki Jokipakka, forward prospect Brett Pollock and a conditional 2016 second-round pick to the Flames. "We've got lots of young players. I'm still going to try to get that pick back, maybe at the draft somehow." The pick becomes a first-rounder if the Stars reach the Western Conference finals and Russell is active for 50 per cent of the games in the first two rounds. A leaky defence was part of the reason Dallas lost its grip on the Western Conference lead over the past two months. The Stars entered Monday trailing Stanley Cup champion Chicago by a point atop the conference. Dallas recently gave up at least six goals three times in four games, although part of the issue is an attacking style that can leave the Stars vulnerable on the back end. In Russell, the Stars add a 28-year-old in his ninth season while sending the Flames a second-year player with no post-season experience in Jokipakka. "It's the team defence, as a team we haven't been playing well," Nill said. "We're going to get better. When you start to approach the playoffs, you can't replace experience. We've had some pretty good young kids playing. This is going to be a great chance for them to gain some more experience with these veteran players." Russell is an elite shot-blocker who has 174 in 51 games this season after getting a career-high and NHL-leading 283 in 2014-15. The soon-to-be free agent has four goals and 11 assists, with 173 career points (38 goals, 135 assists) in 562 games. "I think I bring a competitive two-way game," said Russell, who was traded to Calgary from St. Louis during the off-season in 2013. "I think work ethic is one of my big attributes. I think I can help in that regard." The 24-year-old Jokipakka has 91 games of NHL experience over two seasons, and has the first two goals of his career this season. He was a seventh-round selection by Dallas in 2011. Pollock was a second-round pick by the Stars two years ago, and the 19-year-old leads the Edmonton Oil Kings of the WHL with 67 points (25 goals, 42 assists) in 63 games. The Flames made the playoffs last season for the first time in six years, losing to Anaheim in the second round. But Calgary is well out of contention this season, while the Stars are in a three-way battle with Chicago and St. Louis for the top spot in the West. Now Russell joins a blue line with a rising star in John Klingberg and veterans in Alex Goligoski, Jordie Benn and Johnny Oduya, who won the title with the Blackhawks last season. And the Dallas offence features two of the NHL's top scorers in Tyler Seguin and Jamie Benn. "They've got a lot of firepower up front," Russell said. "I know playing against them, when you play the Dallas Stars, you know it's going to be a high tempo for 60 minutes with them coming at you. It's a tough way to play as a defenceman."